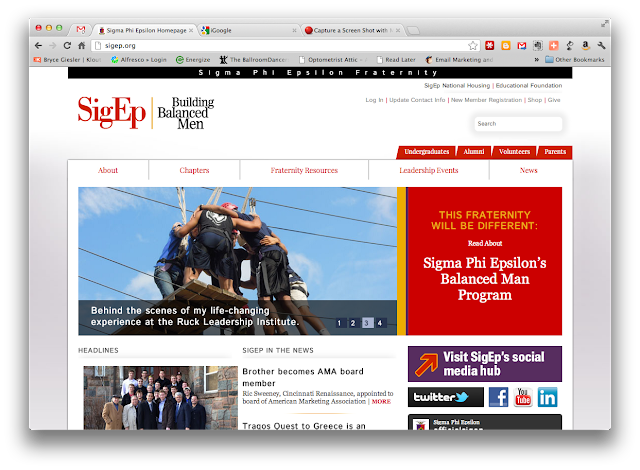 Sanguine et Purpure: The New Sigma Phi Epsilon HQ site is up and open! The New Sigma Phi Epsilon HQ site is up and open! After several months of challenging redesign work the new SigEp HQ site design was unveiled today. You will immediately notice the site has a much 'cleaner' look and feel with good use of white space to focus attention. The navigation has been updated in a way that should make it much easier to find the particular section or information you are seeking. For those of the geek persuasion the new site uses a database driven CMS (content management system) which will make keeping the site up to date much simpler and easier. The site also integrates with the master registration database so changes to personal data made here will flow through and update across the system. Check it out, and tell the folks at HQ where you heard about it first.